I, Lamont: YIMBYs in Newton co-opted by developers? YIMBYs in Newton co-opted by developers? There's an article in Commonwealth magazine that's worth reading to understand some of the forces at work trying to promote affordable housing. 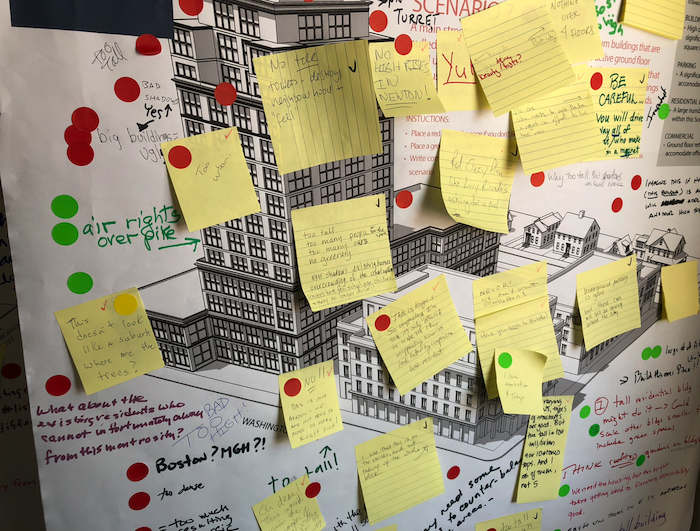 Members of the YIMBY movement (Yes In My Back Yard) among other things are demanding local governments remove restrictions on building apartment buildings and other "dense" housing in areas where it doesn't exist now, such as in certain neighborhoods in Boston as well as Newton and other nearby suburbs of eastern Massachusetts. The idea is, if a massive amount of new housing hits the market, prices will come down and young people and others will have more housing options close by to where they want to live and work (preferably using public transport and other shared transportation resources). The movement has also taken off in Washington D.C., San Francisco, and other space-constrained areas where a lot of young professionals want to live. A coalition of low-income tenant groups says unbridled growth only promises to worsen the affordable housing crisis in Boston and make for more losers at the bottom of the economic ladder. The YIMBY effort “often finds ways to make it easier for developers to build, and that often leads to housing that people can’t afford,” said Darnell Johnson, coordinator for the Boston chapter of Right to the City, a national alliance advocating for low-income tenants. He's right. Developers want free reign to maximize profits, and they are leveraging the YIMBY movement, sympathetic politicians, and the local media and business communities to get their way. The figures in that article show that 20% of permitted construction in Boston since 2011 has been set aside for affordable housing, another ~22% for middle income people (up to $125k/household income) which means all of the rest is "market rate"/luxury. In Newton, the numbers are far worse, and its exacerbated by the relentless teardown phenomenon that removes relatively affordable units from the marketplace -- the types of places that young people, new families, and seniors could live. This has translated to an onslaught of luxury/"market rate" condos and multimillion dollar single family homes where modest houses or apartments once stood. What little affordable housing is being made available is utterly insufficient for the need, and it turns into a convenient negotiation point for other developer giveaways. YIMBY proponents in the article are sensitive to the criticism that they are "mindless shills" for developers. I can't blame them for wanting to find a solution to the affordable housing problem in the Boston area. I do, however, disagree with the way they are going about doing it, which includes the demand that developers be given free reign to build high-density, market rate/luxury housing and often attacking anyone who questions such plans. Follow the #newtonma Twitter hashtag and you will see this attitude in action. I am also very disappointed in how the administration of Mayor Ruth Fuller and the previous Warren administration have tried to ram through a "vision" that lets developers maximize profits at the expense of ordinary people in Newton. We are now witnessing the impact--large luxury condo buildings planned along Washington Street, at the Riverside T stop, and elsewhere, while McMansions go up in once-modest neighborhoods in Auburndale, West Newton, Newtonville, Newton Corner, and Nonantum. I've observed that developers in the north side of Newton who are unable to build by right almost always get what they want when they go to the city to ask for a break. I don't believe the city was serious throwing this out there, and many of the notes express similar skepticism. Rather, this is an attempt to get residents to accept something less outrageous put out by city planners and developers -- say, a five story "market rate" development instead of 12 stories. Like many residents of Newtonville, the looming Korff development makes me very uncomfortable. The 20 existing affordable residential units would be replaced by 171 units, 85 percent of which, by implication, would be unaffordable. The existing residential tenants would be forced out. A sizeable number of long-term and well-loved local businesses would be forced out, and they will not be able to return either. What good does this do for Newtonville? A few weeks ago the TAB had a delightful article about the mother and daughter team of Jill and Jackie who run the The Paint Bar on the northeast block of the intersection of Washington and Walnut. I bet Jill and Jackie are counting their lucky stars that they aren’t located on the northwest block, soon to be the Korff block, or they would be spending their time now looking for somewhere affordable to relocate. At the end of this week’s article on the Orr block plan, Mr. Korff’s attorney Steve Buchbinder was quoted as saying that while “not everyone’s going to be happy” about this project, ”...others see this as something, frankly, that’s exciting.” I wonder who those people are? Korff and his team, looking forward to the profit on investment that they hope will be coming their way? Tax assessors at City Hall? The residents of Newtonville? I don’t think a lot of them are looking forward to this project with excitement. Of course, the developer knew a 15% affordable, six-story building wouldn't fly. In the "negotiations" that followed, most members of the Newton City Council gave the developer just what he wanted: A giant building with 75% market rate/luxury, and 25% reserved for everyone else. If big developments are built in Newton, those numbers should be flipped if there is to be any hope for low-income, young families, young professionals, seniors, and people with fixed incomes to move to Newton. It's the right thing to do, and I think it's something that most people in Newton --YIMBY and otherwise -- would agree with. For this to happen, the developer land-grab for luxury/market rate housing needs to stop. Things will only get worse unless the people of Newton and their local representatives stand up to developers and find a way to make more affordable housing without turning Newton into a sea of McMansions and condos for the rich.